Starting around March 15, 2016, Twitter started rolling out their algorithmic timeline for all users. This algorithmic timeline puts tweets Twitter feels is most important to you at the top of your Twitter Home timeline, regardless of how recent they were tweeted. Doing this effectively means you will start seeing tweets out-of-order and not see the most recent tweets from your followers at the top of your Home timeline. Not only can this cause confusion for those who may not know this has happened, it can cause the tweets from those who you follow for real-time information to not be presented in real-time. 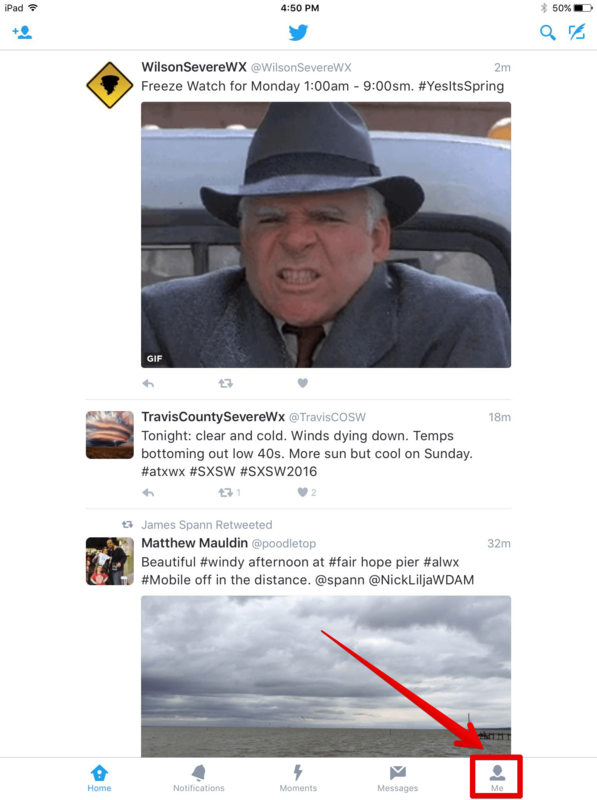 This means that Twitter may not be showing you our real-time severe weather tweets in a real-time manner, in the manner in which you’ve come to expect. Twitter is now rolling all users to this new algorithmic timeline, no matter if you prefer a real-time timeline or not. As you can imagine, this is problematic for our severe weather tweets and other accounts who depend on being real-time. 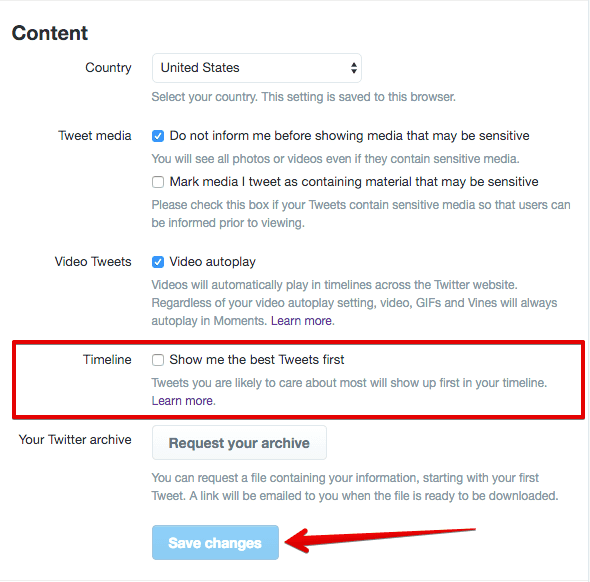 Thankfully, you can revert back to your real-time timeline and effectively “opt-out” of the algorithmic timeline. 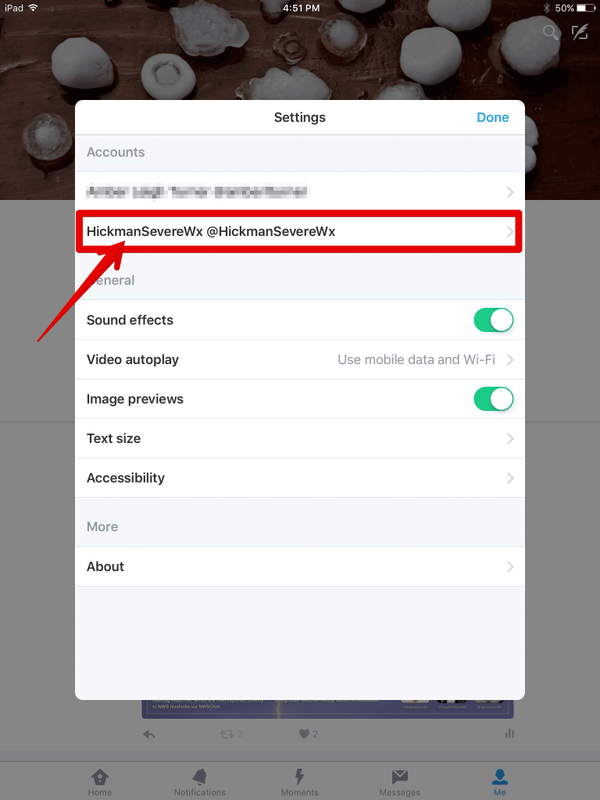 However, Twitter has made this option device- and app-dependent, meaning that you must change this on every app and every device you have, and change this setting in your browser as well. To continue to receive our real-time weather update tweets in real-time, you must opt-out of Twitter’s algorithmic timeline. How to opt-out of Twitter’s algorithmic timeline. 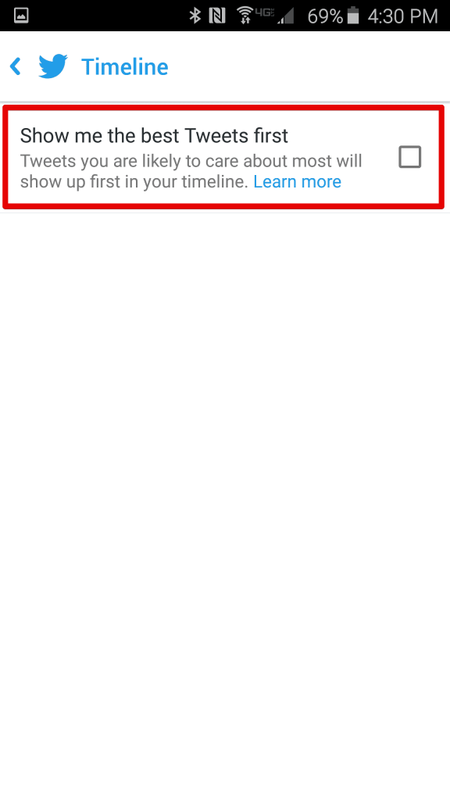 Below is how you can change your Twitter timeline to be real-time and opt-out of the algorithmic timeline for the most popular ways Twitter is used. If you most commonly use Twitter in your desktop browser, follow these instructions to opt-out of Twitter’s algorithmic timeline. Log into Twitter by going to twitter.com. 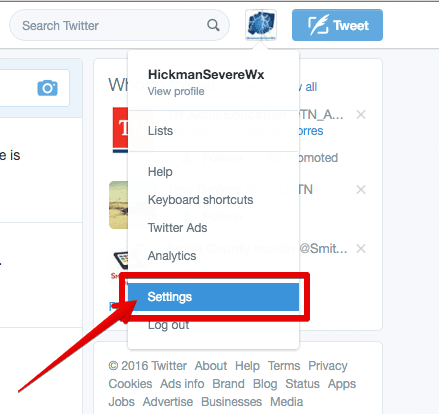 Once you are logged in, go to https://twitter.com/settings/account, or click your profile picture in the top right of the screen, and click “Settings” in the drop-down menu. From your account settings, scroll down until you see the “Content” section. 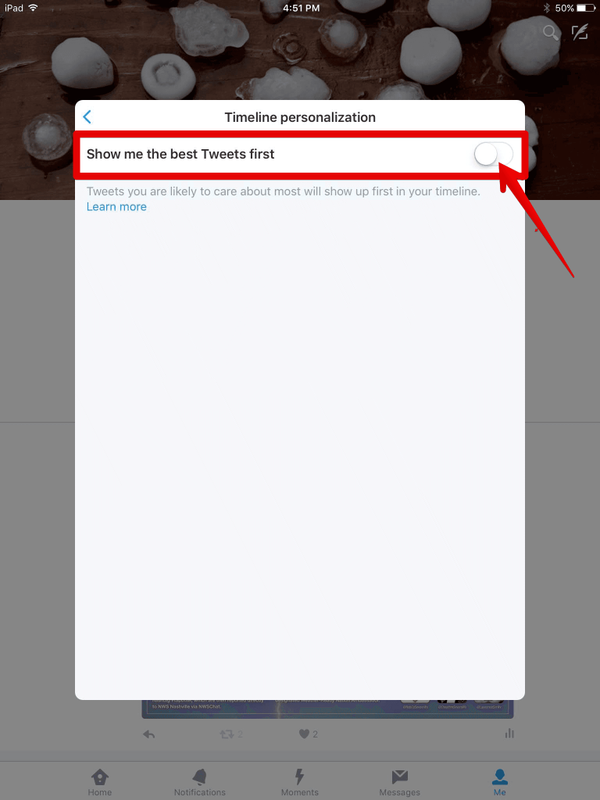 Under “Content,” look for the option “Timeline.” Make sure to the right of “Timeline” that the option for “Show me the best Tweets first” is unchecked, just like it is in the image below. Once this option is unchecked, make sure to save your settings by clicking “Save changes” at the bottom of the page. This means you’ve turned off the algorithmic timeline. Note: Twitter is currently rolling this out to all users, but it is a slow roll out. You may go to this setting and find it unchecked already. If you do, be sure to come back in a few days time to see if it remains unchecked. Because of the roll out, you will, at some point, find this option checked and it must be unchecked in order to receive tweets in real-time. 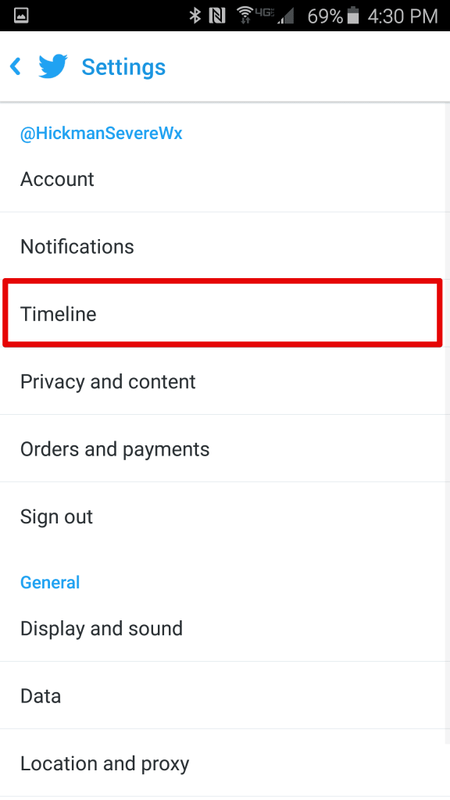 If you access and read Twitter from the official Twitter app for Android, follow these instructions on how to opt-out of Twitter’s algorithmic timeline. 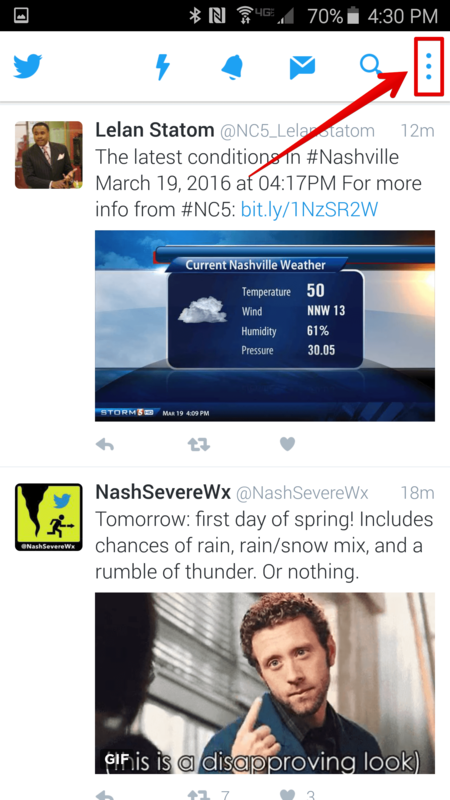 Make sure you are logged in to Twitter on your Twitter app for Android. 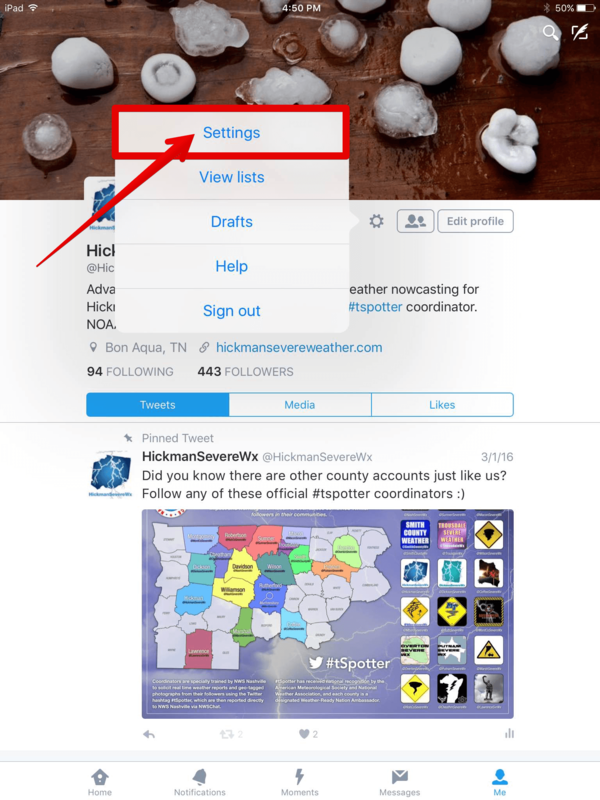 From your Home timeline, click the three-dot-menu-option in the top right to reveal a drop down menu. Click “Settings” on the drop down menu. In the Timeline settings, make sure “Show me the best tweets first” option is unchecked, just like it is below. Once you’ve made sure this is unchecked, save the setting by clicking the blue arrow at the top left to go back to the main Settings page. 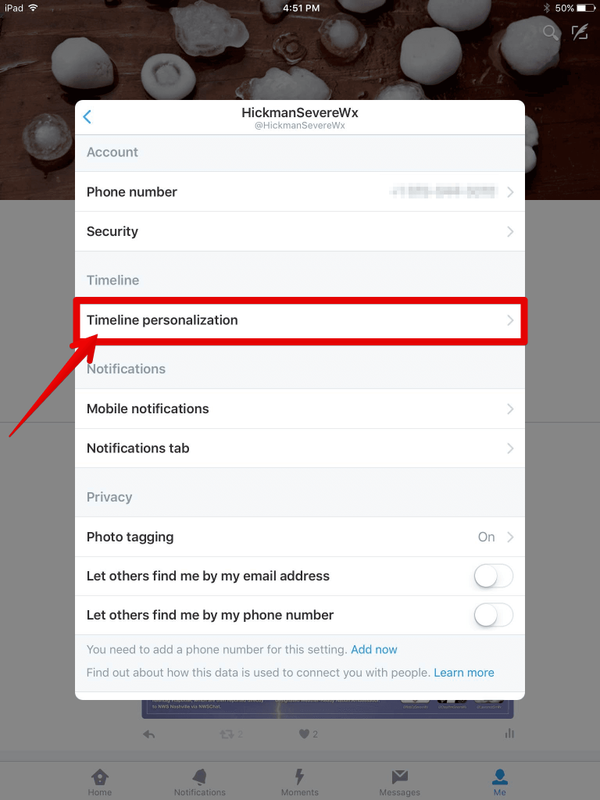 If you access and read Twitter from the official Twitter app for iOS, including iPhone, iPad, and iPod, follow these instructions on how to opt-out of Twitter’s algorithmic timeline. Make sure you are logged in to Twitter on your Twitter app for iOS. From your Twitter timeline, click “Me” at the bottom right hand corner of the screen. 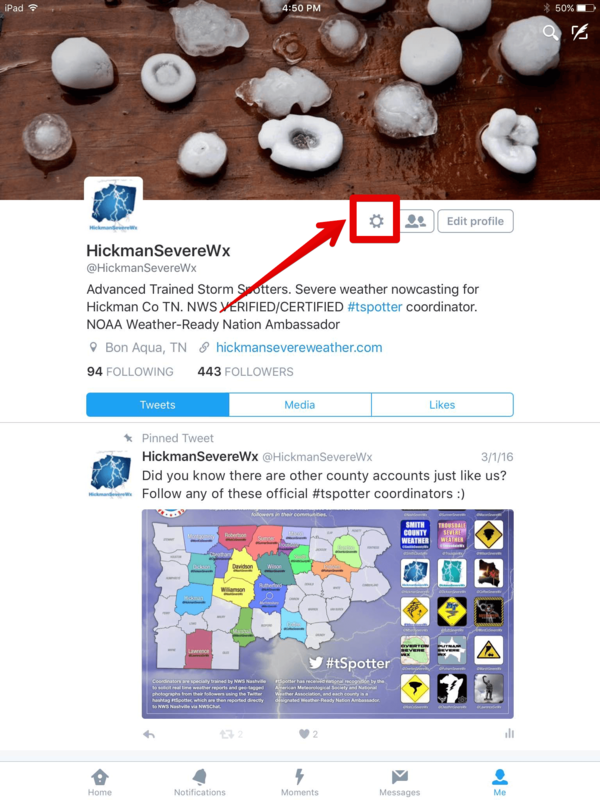 On your profile page, click the gear icon in the center of the screen, right below your cover photo. In the Settings pop up menu, click the account you wish to change. If you do not have multiple accounts, you can skip this step. Make sure the “Show me the best Tweets first” option is unchecked, just like how it is shown below. 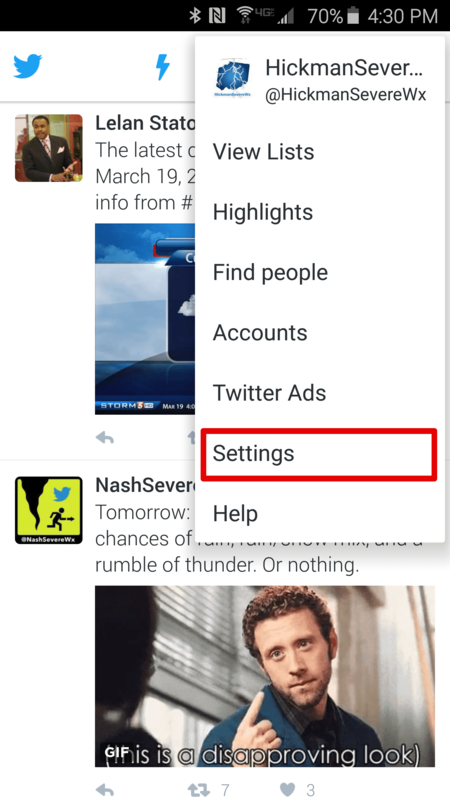 To save this setting, click the blue arrow in the top left of the white pop up box to go back to your settings. So far, it appears that third-party applications do not have the algorithmic timeline. If they do, I will update this as necessary to the best of my ability. If you suspect your third-party app has the algorithmic timeline, look through the settings and find the similar option that is presented in the apps and methods above.